Core tomatoes and smoosh out the seeds. Cut into a couple hunks. It's messy so I use a 5 gallon bucket that is nice and tall to squeeze into. I haul mine off to the compost when I am done. 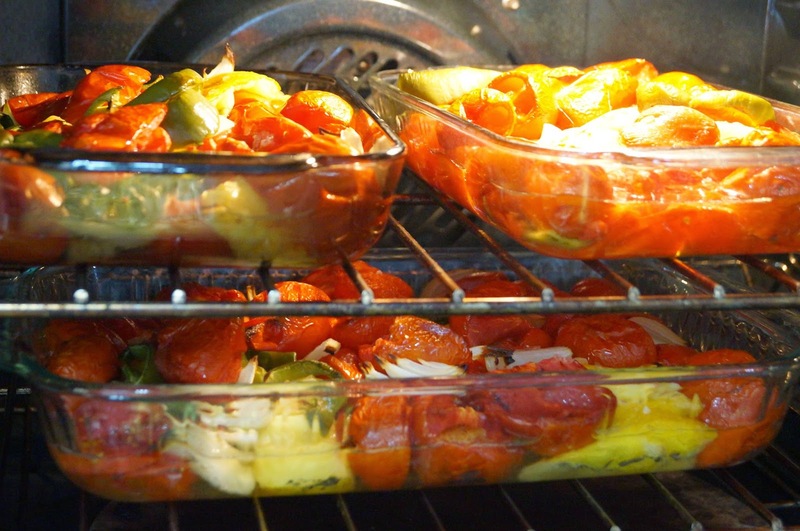 Layer in baking dish along with peppers and onions. Salting a little as you go and finally on top drizzling with a little more olive oil and sprinkling with salt. Bake at 350 degrees for 30 minutes. Open door and squish down the tomatoes and any edges that are already getting browned. There will still be more liquid that come off. I drain that all off too! 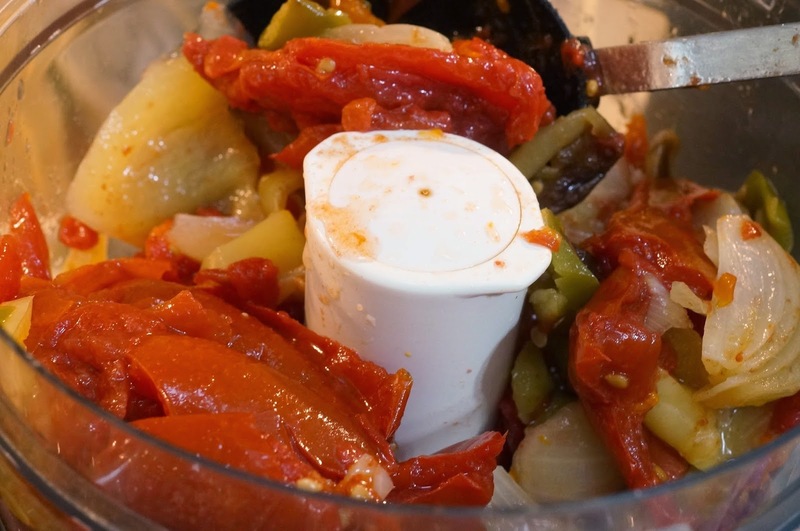 Add your veggies to a food processor (or blender.) Add salt, some sugar (Tablespoon or so,) fresh basil, and oregano. Sometimes I throw in parsley too. Dump into large bowl. Season until it is how you like it. It is all personal preference. You will find as you try different seasonings you will learn what you like and which ones to add more of. It is ready to can or freeze or you can go one step further. I strain mine. As good as the processor is there are still some seeds and some pieces of tomato skin I do not want. Add it bit by bit to the strainer and press it through. This is what is left. Don't despair, I have a use for this!! Check out my Dehydrating Tomato Skins to Make Tomato Powder tutorial. You are now ready to do one of 4 things....water bath can it*, pressure can it*, freeze it, or eat it! 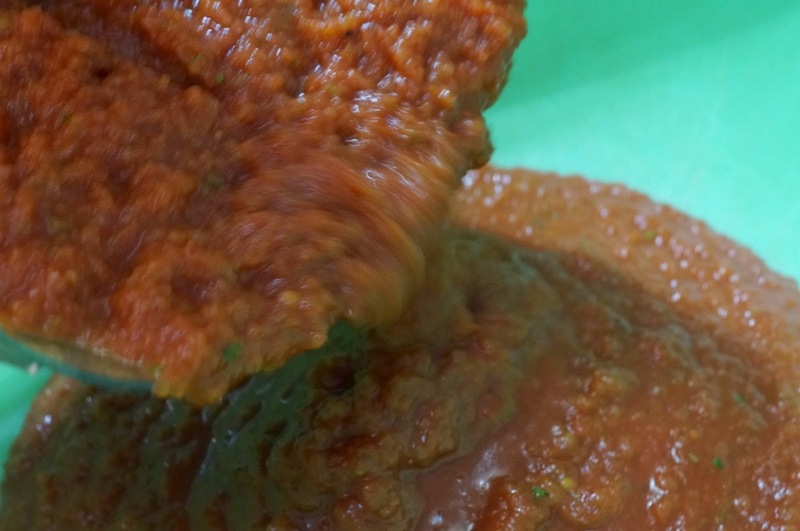 If you want to make pizza sauce. Strain it one more time through a metal sieve or you could spend your time boiling it down. I personally do not have time to make sure it is stirred during that time so it doesn't burn. The thicker it is, the better so your crust doesn't get soggy. I can those in 1/2 pint size. *As with all canning recipes please refer to the National Center for Home Food Preservation for information on what can be water bath canned and what needs to be pressure canned. Each elevation has their own time needed to process. General rule of thumb is items under 4.6 pH can be safely water bathed. Add citric acid as needed. Oh wow...My mouth is seriously watering. YUM. Love the whole food recipe Jenny. I can always count on you to share recipes with real food. 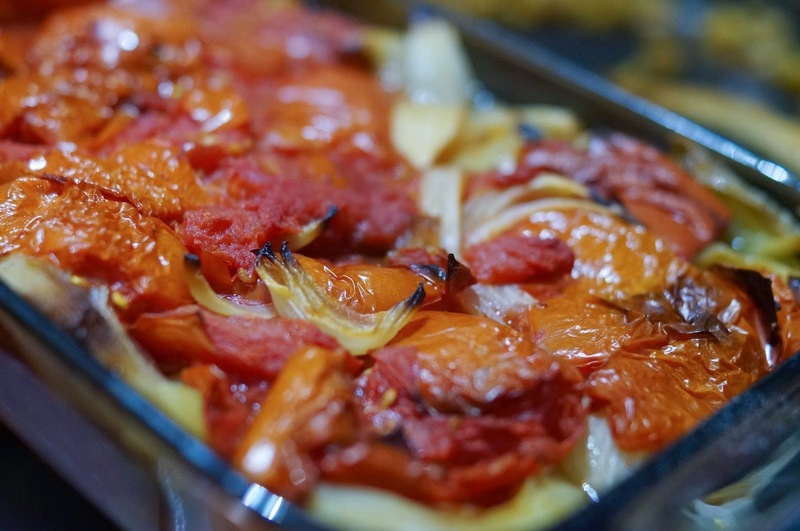 I have a few recipes that I go to again and again every year during tomato season. Can't wait to try this one and add it to my favorites. Loving everything about this sauce Jenny...oh the yummy possibilities! 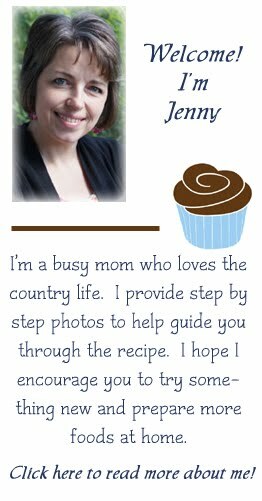 Your photos and step by step directions are wonderful and will be appreciated by many!! Well done! 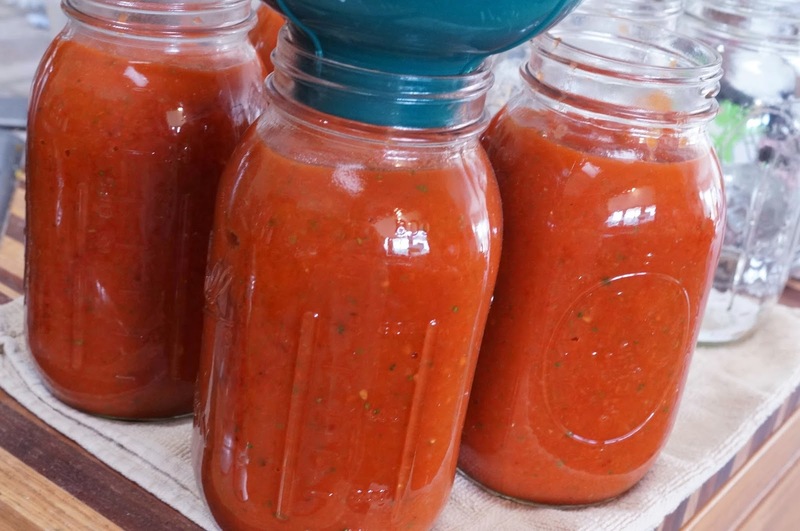 My tomatoes are all ripening at once, so this would be a great way to use them up! Lovely recipe. Your recipe sounds delicious. 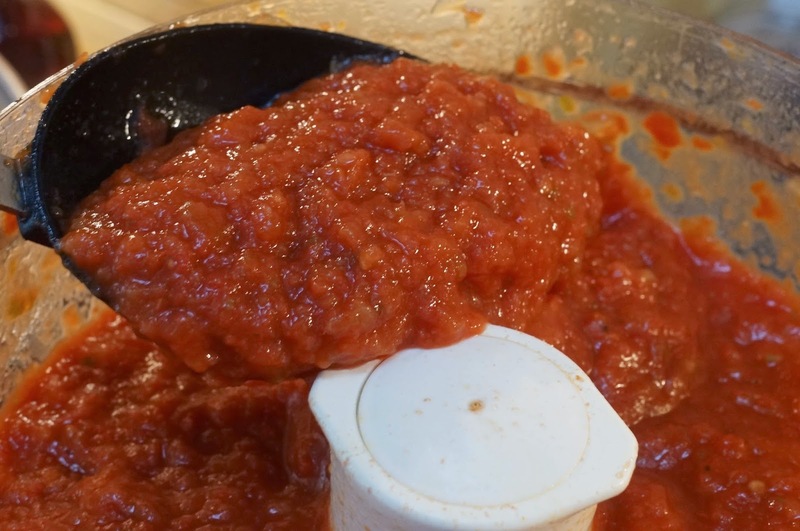 Thanks so much for sharing such a terrific Roasted Marinara Sauce, I will definitely give this a try -- on a smaller scale though it definitely is easy to make. Your fresh Marinara sauce sounds really delicious. Thanks for sharing. I just pinned this. Thanks for sharing, Jenny. 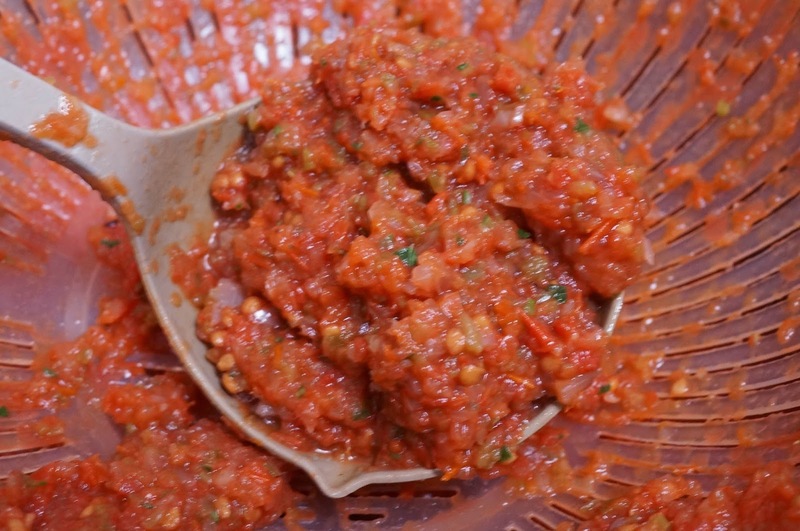 I love marinara sauce so much and am excited to try it with roasted tomatoes for extra flavor.